With two thousand twenty sixteen being an incredibly unusual presidential election year, it seems the martini should probably the potent drink of choice to calm rattled nerves. It’s classic, elegant, and dependable and that’s exactly what’s needed during times of instability. Let’s take a quick look at the history of the Martini cocktail. Martinez, California was the birthplace of the Martini in 1874, according to a plaque in the city which was dedicated by the Joaquin Murrieta Historical Society (Chapter 13). The plaque states “The drink consisted of ⅔ gin, ⅓ vermouth, a dash of orange bitters, poured over crushed ice and served with an olive.” It is unclear whether the vermouth was dry or sweet. During the prohibition years (1920 – 1934), the lower quality “bathtub gin” required some masking of the flavor so a ratio of one-to-two was used along with a twist of lemon. 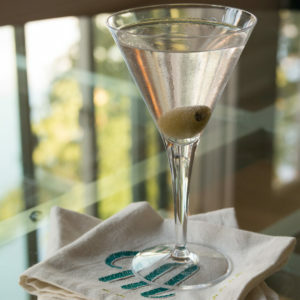 In the 1940’s, after the repeal of prohibition, availability of better tasting gin caused the Martini recipe to become three or four parts gin to one part vermouth. In many cases, much less vermouth was used and often it was omitted altogether. The size of the Martini cocktail during this time (and well into the mid-century) was only about a two ounce pour. That’s why they could have a two-Martini lunch and get away with it! In the 1950’s, Auntie Mame had little nephew Patrick Dennis stirring up Martinis for the cranky banker Mr. Babcock. The Martini fell out of favor in the 1970’s but returned in new forms in the late 1980’s. The new Martini usually consisted of vodka instead of gin and vermouth was verboten. The drink also became super-sized with some pours reaching up to seven or eight room-spinning ounces! In 2016, there’s been some downsizing of the Martini. Some establishments have pulled the pour back to as little as three ounces, but the price of the cocktail has not reduced at all. It’s most likely the smaller drink sizes have nothing to do with returning to the drink’s origins, but rather, are a cost-cutting, profit-enhancing measure. 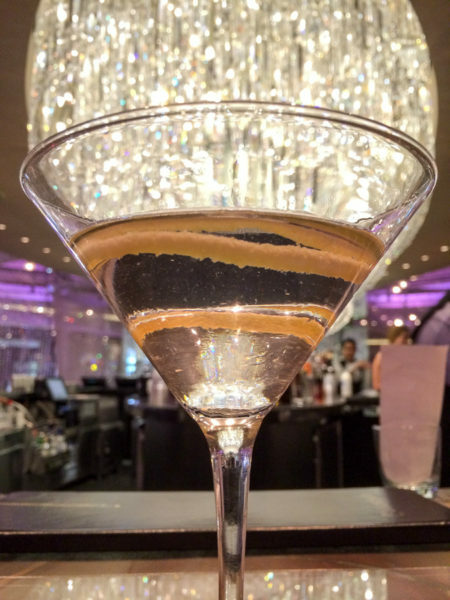 In hotels and resort areas, it’s common to pay $18 to $20 or more for a Martini. Las Vegas strip hotels now add on a $4 to $6 up-charge per drink on top of the already high drink price. For history, beautiful photography, artwork and more information about the Martini cocktail, get a copy of the book Martini: An Illustrated History of an American Classic by Barnaby Conrad III. Here are my favorite methods for preparing the Martini. Enjoy! Place the olive or twist of lemon peel into a chilled 6 oz. capacity Martini glass. Add plenty of ice along with the vodka to a stainless steel cocktail shaker or Boston shaker. Add the vermouth to a chilled 6 ounce capacity martini glass. Swirl the vermouth around the glass to coat it and discard the remaining excess liquid. Place the olive in the glass. Add plenty of ice along with the gin to a stainless steel cocktail shaker or Boston shaker. There’s one more version of the Martini to suggest and it is James Bond’s Vesper, which uses both vodka and gin. An excellent adaptation has been created by my friend, author and photographer O. Henry Mace. Visit his website to learn more about the Vesper and to view the updated recipe.